Now that a couple of weeks have passed by since the inaugural Vancouver Craft Beer Week has finished, there’s been time to get feedback in various shapes and forms. Given that we sold out most of our events, that the mayor officially proclaimed Vancouver Craft Beer Week and came to celebrate the festival kickoff with us, and that the mainstream media gave VCBW some good coverage, one could deem it a success for craft beer. Nevertheless, VCBW did not work for some. I want to address a few of the issues that have come to my attention, especially some myths and misconceptions that result in lost opportunities. First off, I want to point out this was the first such festival for Vancouver; in fact, for Canada. You never get everything right on the first go, but you hope to be in the ballpark (see above). In getting third parties on board, it also didn’t help that we had the Olympics, the Playhouse International Wine Festival, Dine Out Vancouver, and the playoffs as a significant combined distraction. Under the circumstances, one may have to forego the ideal and opt for what is expedient. Next time around, we hope parties will get involved early enough so that we can achieve the ideal for the 2011 VCBW. A couple of years ago, I wrote about how what is considered to be the working man’s beer is anything but. Ironically, the worker is persuaded through multi-million dollar marketing campaigns that guzzling a multinational corporation’s industrial lager is more appropriate than buying from a local small business, a style of ale with a history pre-dating lagers by centuries. Craft beer is somehow “fancy,” even though a barley wine, bitter, or brown ale is still made, like lager, with water, barley, hops, and yeast. As you can see, there’s nothing fancy about what our craft brewers do. They just make a good honest brew that doesn’t have to have micro-bubbles, be cold certified, filtered five times, called something it isn’t, or served with a lime in order to sucker you into drinking it. There are more flavours in beer than honey and lime waiting to be experienced. Meet a craft brewer, and they will be happy to show you the way. 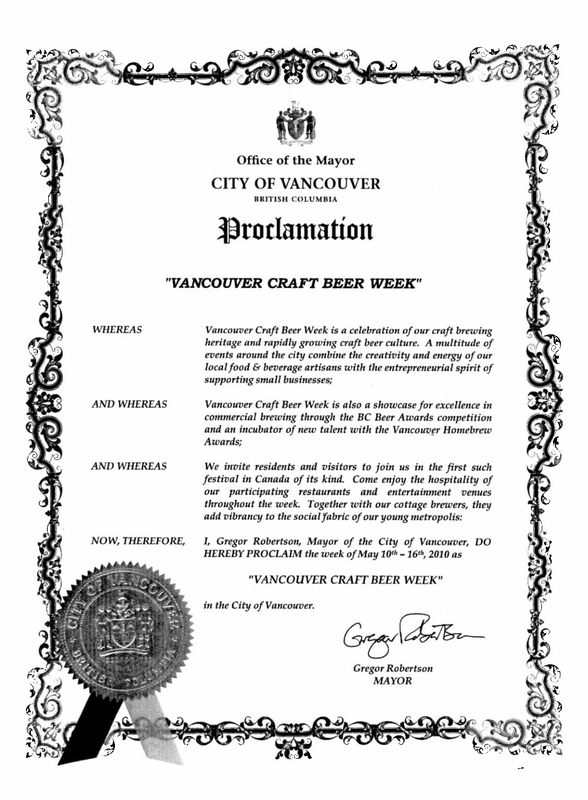 Why Vancouver Craft Beer Week? Vancouver has experienced varying degrees of success with its beer festivals, but hasn’t found its groove to the degree that Victoria has with the Great Canadian Beer Festival or even Penticton with the Okanagan Fest-of-Ale. Having heard this topic brought up on a number of occasions over the past couple of years and the inevitable lamentations that followed, I was determined to do something about it. The main challenge with putting on an event similar to the aforementioned, though, is the money required to stage it. It seems that those with the passion don’t have the money and those with the money either don’t have the passion or don’t have the confidence in you pulling it off if you haven’t already proven yourself. If passion for craft beer and money were hand-in-hand in Vancouver, then we wouldn’t be in this Catch-22 predicament. Nevertheless, staging a large event on a single day without a reputation from a positive track record is a risky venture. There is a lot riding on just a few hours. The GCBF and OFOA got to where they are today by lots of hard work, building them up over more than a decade from smaller beginnings. Would we really have to wait that long before Vancouver finally has itself a beer festival worthy of its status as the largest metropolis in Western Canada? Could we wait that long? 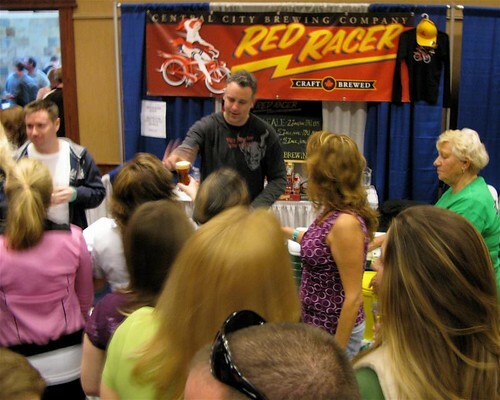 Patrick Cumisky serving up some Central City Red Racer IPA. You may be surprised to learn that it takes a lot of good beer to make a fine wine. That might explain why Penticton’s Cannery Brewing sells more beer in Naramata than all of Alberta and why Silverado Brewing operates a burgeoning brewpub on the grounds of a winery in Napa. It may also explain why the Okanagan Fest-of-Ale in Penticton has no problem still selling out in its fourteenth year. This year was the first time I attended the OFOA. I had heard the festival was starting to get on the rowdy side in recent years (from the perspective of older beer geeks like myself). My suspicions were aroused when a half-dozen twenty-something males in the lineup in front of me started whooping and hollering even before the venue doors had opened! They were not already drunk. I guess the OFOA must be their biggest event of the year — combine drinking and two-dimensional food (pizza) with skirt-chasing and brawling et voilà, Christmas in April. How about some Paddock Wood London Porter from Saskatoon? I expected, therefore, to see plenty of young bucks drinking themselves into alcohol-induced belligerency, rather than taking the time to learn about and appreciate the beer. However, festival organizers seemed to have taken note of the downward trend and made some changes. Tickets were reduced by 1,000 for each of the festival’s two days, the cost was increased, and sales were strictly limited to before the event. It was also suggested that the music, for the most part, was chosen to coax a more mellow mood than feed the fire. These measures and vigilant security seemed to effectively keep a lid on things. A number of vendors expressed to me a resulting improvement. 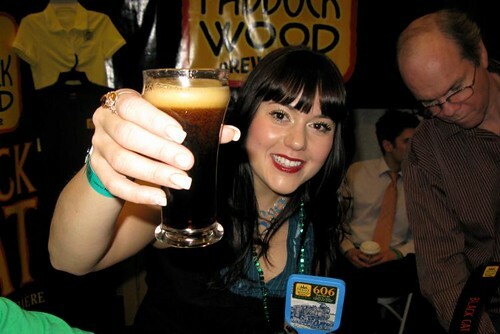 On the tasting side, the majority of the festival was devoted to craft beer. There were 17 microbreweries directly represented, including four Washington breweries; two importers poured five beers from four foreign craft breweries; two mass-market beers squeaked in over the bar; and a smattering of alcopops and a macro-cider were there for the females who think they don’t like beer and will continue to think so until their menfolk graduate from drinking macro lager as their everyday beer. Crannog brewmaster, Brian MacIsaac, accepts the People's Choice Award for his Back Hand of God Stout. Molson Canadian managed to weasel in a pseudo presence at the Boston Pizza booth, unofficial sponsor of unhealthy eating and, by extension, unhealthy drinking. Nevertheless, the food offering was actually better than the Washington Cask Beer Festival. The Barking Parrot took it for best value in my books. (How can you beat a cheeseburger for $1.00?) The Kettle Valley Station Pub offered a decent Louisiana Chicken Burger for $2.00. However, the best eating was easily from Salty’s Beach House — Thai Mini Meatballs, Scallops Remoulade, and fresh-shucked oysters. How civilized! The majority of festivalgoers seemed to agree too as Salty’s won the award for best food. While there were seven hours on Saturday to make your way through the 60-odd beers worth trying; between drinking, chatting with brewers & fellow CAMRA members, eating, and taking in some of the entertainment, I didn’t manage tasting them all. Mind you, I’d had a number already. Things especially slowed down later in the day when the crowd got much thicker and lineups were ten deep in places. I mostly concentrated on trying what was new to me and found myself quite satisfied by the end. The festival finale was the announcement of the Industry and People’s Choice awards. 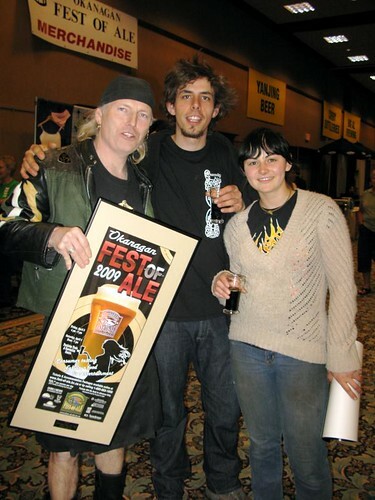 The people chose Crannóg’s Back Hand of God Stout as the festival’s best beer. A panel of judges, including my editor at Northwest Brewing News, Alan Moen, selected Pyramid Apricot Ale as the best macro beer, while Shuswap Lake’s (aka Barley Station) Sam McGuire’s Pale Ale was their choice for best micro beer. And that’s what I would call a successful conclusion. For more OFOA photos, see my Flickr Beer Festivals Set. I also have some photos from my tour of Cannery Brewing the day before. Speaking of culinary tourism, Spinnakers hosted their inaugural cask festival on March 14 from noon to 5:00pm. As they’ve been tapping a different cask every weekday since December, it was only a matter of time before they would have a festival. I got word that the planning was underway when two of their employees attended the X-mas X-treme Caskival at Dix on December 6 to take notes. The timing of Spinnakers’ cask festival was somewhat unfortunate in that it coincided with Just Here for the Beer’s Wine & Beer Festival at the Plaza 500 Hotel in Vancouver. Forced to make a choice, I selected Real Ale and an excuse to get out of town. Even with a high chance of rain, a day spent indoors imbibing cask-conditioned ale from some of BC’s top breweries, in the company of brewers and the craft beer cognoscenti, is time well spent. The event was held upstairs in Spinnakers’ pub, which meant a limited number of tickets were available. Demand seems to have greatly exceeded supply as they sold out rapidly. Perhaps for the next one they will consider a larger venue. However, I doubt they will close off the downstairs dining room as I’m sure they make a lot more money from regular diners than drinkers. Some of the brewers who contributed to the cask festival. In comparison to the more freestyle nature seen at Dix Caskivals, these beers were fairly indicative of their respective styles. A little bit of experimentation was seen with Canoe’s stout, Granville Island’s Ginger Beer, Spinnakers’ Black Velvet, and Swans’ porter, but nothing as eccentric as Dave Varga’s Masala Pale Ale or Tariq Khan’s Chipotle Cream Ale that they brewed for Caskival. Canoe Habit Espresso Stout is a collaboration with a Victoria coffee roaster. I like both beverages; even better together! Granville Island Ginger Beer appeals to all those ginger lovers with plenty of Hawaiian ginger to spice things up — great food pairing beer. Spinnakers’ Black Velvet was a blend of Irish stout and sparkling white wine. This was my first taste of the fest and I found it tasty, light, and refreshing — somewhat reminiscent of Unibroue Chambly Noire. Swans Pod Porter was conditioned with organic Madagascar vanilla pods, giving it a nicely enhanced vanilla flavour that is a major contrast to Granville Island’s over-the-top, cloying Winter Ale. Lovers of the latter should compare the two in a side-by-side tasting. Spinnakers Katie Zimmerman announces end of their inaugural cask festival. Although Phillips did not bring a cask, they did do something out of the ordinary that I found most welcome, despite some people’s grumblings — they served their draught IPA through two randalls, one containing Cascade hops, the other Centennial. Basically, they were dry-hopping the IPA even more on the fly. Delicious! This was the first opportunity I had to try the mysterious Lighthouse Riptide Pale Ale. It’s their first new beer in three years and I must say that it’s about time! Offering seasonal beers is a basic practice for improving marketing: at the very least, you have more to say to the public to get their attention. Naturally, I was curious to find out more about the Riptide — how is it different from all the other pale ales out there; what malt or hops did they use, etc. Unfortunately, they won’t tell me anything beyond their generic marketese: ‘choicest imported malts, mated with a unique hop blend…’ Doesn’t everyone say that? Actually, no. If you look at the festival programme, virtually all of the other brewers talk about the specific ingredients they used for their beer. No big trade secret. Without specific measurements and knowing the particular brewing techniques, it is highly unlikely a brewer will be able to exactly match another’s beer. There are too many variables. I find the secrecy rather silly. Riptide doesn’t have a je ne sais quoi that makes it truly unique. It’s just another pale ale aiming for broad drinkability. Five hours of drinking means that you need to have something to eat. Spinnakers is a good place to be hungry. I ordered their pulled pork nachos and Highland Beef Burger. There was no need for dinner after! Nevertheless, as a lagniappe, complimentary handmade white chocolate saison truffles were served to sweeten the day’s experience. I always find these festivals come to a reluctant end. There’s never enough time to talk in a lot of detail to all of the brewers and your craft beer comrades and still be able to taste all of the beers. Fortunately, if you wanted to stay around, Spinnakers honoured purchased tasting tickets and you could order pints of any of the remaining casks. I had a ferry to catch, so I made a hasty departure with my travelling companions, Spinnakers Barley Wine and India Pale Ale malt vinegars for souvenirs.